2017 was a busy year at ACEEE. We released our first scorecard of US utilities, introduced our new Health and Environment Program, made a major foray into visual storytelling, and analyzed a plethora of energy efficiency developments and trends. We’ve chronicled all of this, and more, on our blog throughout the year. We also lost two energy efficiency icons and ACEEE founders this year: Art Rosenfeld, a renowned physicist and father of the energy efficiency field, and Marc Ross, University of Michigan professor and ACEEE’s first research director. We will proudly carry on their legacy in 2018 and the years to come. Theodore Roosevelt once said, “The more you know about the past, the better prepared you are for the future.” So, in the interest of knowledge, below are our top blog posts to read (or re-read) as we head into 2018. Our first-ever scorecard of US utilities highlights the top performers and key findings. Demand response programs are a critical supplement to utilities’ efficiency efforts. Energy efficiency remains the lowest-cost electricity source for consumers. Bonus: Check out our People Who Save Energy video series to hear from the people making homes and businesses more energy efficient nationwide. The energy efficiency workforce is sizable and diverse. We look at the energy efficiency workforce in response to a New York Times article. Energy efficiency investments and approaches could further increase investment in the future. PACE loans are not the same as those that caused the 2008 financial crisis. Boosting fuel economy, contrary to industry claims, does not make cars and trucks unaffordable. The recent federal tax bill could both hurt and help energy efficiency. An ACEEE analysis found that US energy intensity (energy use per dollar of GDP) has improved by 2.5% per year in the past two years, continuing a positive trend. The US economy has continued to grow while energy use has decreased. 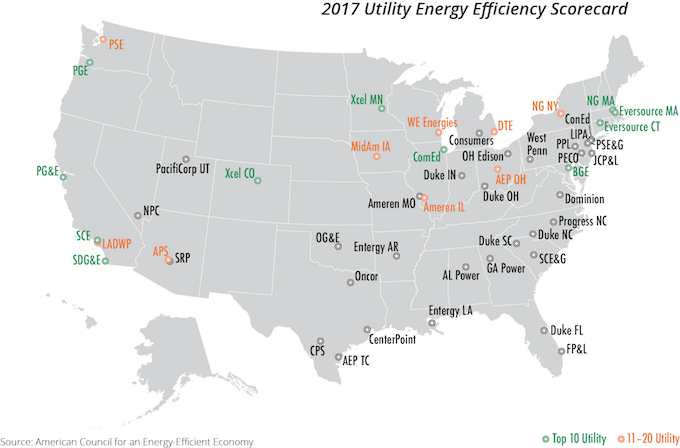 For a rundown of 2017’s biggest developments and a look ahead to 2018, check out ACEEE executive director Steven Nadel’s recent blog post, “2018 will be a year of seizing opportunities and facing challenges” and stay tuned as we continue to analyze the latest energy efficiency data, trends, and developments throughout the coming year.